Better Than Photoshop - Anti-Age Naturally! Have you ever edited your photo on a computer? The most popular program is called “Photoshop,” but there are many others. These days, you can even edit your pictures on your phone. With the click of a mouse, or the push of a button, you can make all your biggest flaws disappear. Wrinkles, birthmarks, age spots, blotchy skin, sagging folds… ALL vanish in minutes. Right before your eyes, you can “de-age” your photo and look decades younger. Suddenly, you’re in control of how you look, and what other people think about you. There’s just one problem with Photoshop. It only works for pictures. But today, I have GREAT news. I partnered with a team of Stanford researchers to introduce a new anti-aging technology I believe is the closest thing you’ll EVER get to “Photoshopping” your appearance… for real. The changes run so deep and happen so quickly, many of my patients say it feels as easy as editing their picture on a computer screen. The secret are hundreds of “growth factors” your body makes on its own, but disappear and decline as you get older. This Stanford team discovered a way to get these growth factors back in your skin. And the effects are as stunning as a well-edited photo. Give me a minute and I’ll explain exactly how this works. But first, please allow me to introduce myself. I’m Dr. Al Sears. 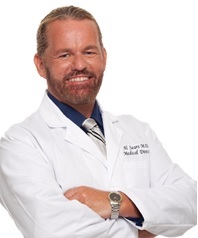 Dr. Al Sears, M.D. currently owns and operates a successful integrative medicine and anti-aging clinic in Royal Palm Beach, Florida, with over 25,000 patients. His cutting-edge therapies and reputation for solving some of the most difficult-to-diagnose cases attract patients from around the world. As one of the first doctors ever to be board certified in anti-aging medicine and a certified nutritionist, I develop my own natural beauty formulas to give my patients effective, wholesome and organic products that they can feel good about putting on their skin. That’s why I was so excited to work with the Stanford team to actually help reverse the appearance of aging – naturally. You can get the regenerative benefits of stem cells without ever using, or coming into contact with stem cells. And that’s the secret that helps you make changes to your appearance… Just as easily as you would edit your picture on a computer. I’m not just talking about looking younger — although that’s an amazing benefit of these growth factors that we’ll talk more about in a minute. I’m talking about tapping the natural power you had when you were younger. You see, growth factors are found naturally in your body. They “instruct” the skin to replenish and grow. And to repair itself. But as you age, your supply of growth factors drop, and that’s why you develop wrinkles, age spots, sunspots, and more. You also have a harder time healing cuts and other wounds. Fortunately you can replenish these growth factors quickly and easily. So it’s now possible to restore the appearance of younger skin. In the 1990s, stem cell research was a touchy topic. Why? Because almost all research used human embryos. As funding dried up here in the U.S., scientists in other countries began using stem cells from ADULTS, and NOT from embryos — avoiding the “when does life begin” controversy altogether. Thanks to this newer technology, pioneers like the team from Stanford I’m working with tap the power of stem cells safely, and without the concern from decades ago. When we’re young, we have enough anti-wrinkle growth factors to keep our skin smooth as silk. As we lose these growth factors, our skin gets thinner and loses elasticity. But replacing real human growth factors adds elasticity, thickens and plumps up your skin, supports collagen production, and removes the appearance of many of the fine lines and wrinkles. As we get older, age spots and sunspots are common. That doesn’t mean you have to suffer with them. Age spots come out as we lose whitening growth factors. When we add these back in, the appearance of age spots vanishes. When you’re young, you’re able to heal from most wounds. Cuts and acne heal and rarely leave scars until you’re older. 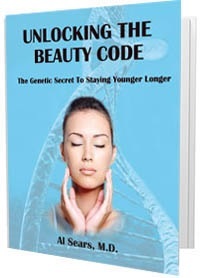 Truth is, wrinkles, scars, age spots, and all those things that make you look and feel “old” are the result of your body’s natural loss of growth factors. This loss happens to you and everybody else as you age. The solution is simple — if not easy. Replenish your growth factors and you can easily reverse the appearance of wrinkles… age spots… photoaging… even scars — without resorting to costly injections or painful surgeries. A simple strategy, but until recently, you just couldn’t do it. You see, human growth factors create the appearance of younger-looking skin and help support healthy-looking skin and tone. There are plenty of “growth factors” on the market being used in anti-aging products. But for the most part, they don’t work. Or they don’t work as well as they should. You see, most of the growth factors being used commercially are synthetic. They’re not REAL growth factors. And they don’t have the full range of anti-aging properties that human growth factors do. Not by a long shot. Anti-aging products that contain synthetic growth factors might provide some help, but it’s really a crap shoot. And until now, that was your only option. That’s why I was so excited to begin work with this Stanford team. Together, we’ve developed the science that delivers human growth factors through a simple topical solution. Along with this team of Stanford scientists, I developed Regenesis GFSC. And I’m very excited to share it with you today. 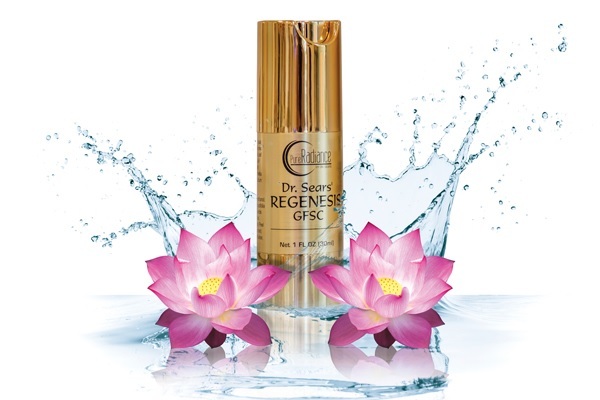 Regenesis is a topical solution that you apply to your skin twice daily. It contains human growth factors — no plant or animal growth factors — and no stem cells. This is the first time in history that an anti-aging formula containing human growth factors has been so easy to use. It’s true that some of the very rich and powerful have had access to this biotechnology for years through their upscale doctors. But for millions of Americans, this technology was not easily accessible. I made the decision early on that I wanted Regenesis to be available to everyone… not just the elite. It’s not cheap to produce, but I’ll tell you in just a minute how you can save over 30% off the regular price if you order today. I think you’ll find the price quite reasonable when you realize an elite few have been paying THOUSANDS of dollars for the same results for years. How well does Regenesis work for anti-aging? A visible reduction in fine lines and wrinkles. Near spot-free, smooth, creamy skin. A healthier tone and complexion. That’s the power of this new technology. Regenesis contains growth factors from adult tissue only: My Stanford team discovered a way to extract growth factors from adult adipose tissue — no embryos are needed and are never used. Regenesis contains 350 human growth factors: No plant or animal growth factors are used, and every important growth factor is present to ensure maximum effectiveness. Regenesis does not contain any “magic” ingredient: It simply replaces the growth factor proteins that you lose when you age. Regenesis contains NO STEM CELLS:Only the growth factors are included in the product, not the stem cells they were derived from…BUT these growth factors actually have the same potent effect as the stem cells themselves. Regenesis is 100% safe and natural: There are no harsh chemicals… you already have these growth factors, you’re just adding more… and they simply allow your body to act, look and feel younger. Regenesis works for EVERYBODY: Growth factors are used by every person on the planet. Regenesis simply replaces what’s lost naturally through aging. Regenesis is safe, simple to use, and it works. It provides your body with the tools to smooth out the appearance of wrinkles on its own… to erase the appearance of spots and other blemishes on its own. It simply gives you the same tools you had to do these things on your own when you were in your early 20s — an abundance of growth factors. “Plumper” skin with the appearance of far fewer lines and wrinkles thanks to Regenesis and the increased availability of growth factors. The appearance of old scars begins to fade dramatically as these growth factors allow your body to transform your appearance — naturally. The appearance of age spots, sunspots, and photoaging all start to become a thing of the past as the whitening growth factor begins to take hold. Again — that’s all in as little as 4 weeks. I’ve seen it myself, first hand. It works for everybody — male or female, every age, every race — because it replaces what your body is naturally used to. Real people like you and me are seeing stunning results in a single month. 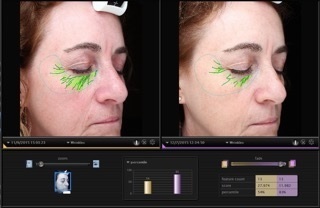 Here’s another success story documented by a new technology called VISIA clinical imaging. VISIA is a software program that captures and analyses close up, high-resolution facial photographs. Have a look at the picture on the left. The wrinkles on this woman’s face have been tracked by the computer and show up as green lines so you can see them. In her “before” picture, the wrinkles stretch around her eyes and extend down into her cheek. Now look at the picture on the right. After using Regenesis, the appearance of her wrinkles started fading, pulling back, and in some cases disappearing. According to the computer analysis, her wrinkles improved by 22%. Imagine what Regenesis could do over a longer period of time? Here’s another patient who used Regenesis to make the appearance of fine lines and wrinkles disappear. 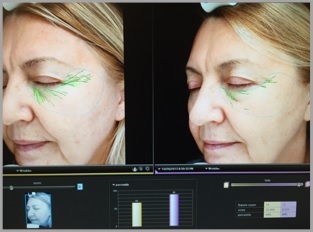 Using the VISIA clinical imaging technology, you can see her “before” picture on the left. There’s a solid mass of green lines under her eye. Every green line traces a wrinkle on her face. Her “after” picture on the right shows how Regenesis made the majority of those wrinkles vanish. What you get is a younger-looking face that stays with you 24/7. Regenesis is better than Photoshop… Better than a mask… And is the only REAL way to “edit out” the parts of your appearance you don’t like. And you can get lasting results in a matter of weeks! And that includes my friends, family, and patients. Right now, I have very limited supplies. This is BRAND NEW, and I only have ONE shipment. After that, we’ll do another run, but I don’t know how long that will take. If you’re ready to take years — or even decades — off your appearance, you will NOT find a more effective “de-aging” skincare formula anywhere in the world. Not in any shopping mall… Not in any salon or day spa… Not in any doctor’s office. This is the ONLY source for this unique technology. And I’m thrilled to be a part of it. Packed with natural, healthy and safe human growth factors, you can take advantage of our SPECIAL VIP Introductory Offer today and get 2 Bottles for just $300. That’s over 30% off the regular price of $458! PLUS, I’ll cover the shipping and handling myself, so you don’t have to worry about hidden or extra fees. After this shipment is sold out, you’ll have to wait. When you buy 2 bottles of Regenesis for just $300, I am going to include the special report as a Free Bonus. That’s a $14.95 value, absolutely FREE! As you can see now, this is an offer too good to pass up. No matter what your age, in just a few short weeks, you can begin reversing the appearance of wrinkles, age spots, scars and acne. I understand how worthwhile investing in your beauty is, I also understand how frustrated women feel when they don’t get the results they’ve been promised … after spending hard-earned money to get them! And just as bad, many women have shared with me how often they’re filled with regret when they decide not to buy something. You still wonder if you might have missed out on the perfect product! Skin care is a tricky area. It’s very individualized and results can vary tremendously. Ultimately, it’s really hard to see if something works for you until you try it. So, because of all this, I like to do something many anti-aging experts and skin care companies don’t do. 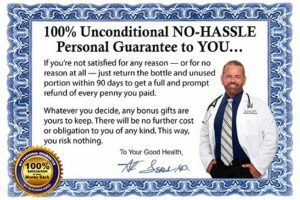 I like to give a full satisfaction guarantee. You must be completely satisfied with this product, happy you invested in this special skin care technology. You must see visible results. 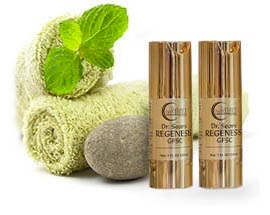 You must see that Regenesis is “de-aging” your face within weeks. You must feel good about using Regenesis on your face when it comes to your own health and safety. Regenesis should only bring you pleasant results – not unwanted side effects. If you’re not satisfied in any way, you can send your bottles back – even if they’re empty – and we’ll promptly refund you your entire purchase price. No questions asked. And the FREE Bonus Report is yours to keep. I want you to have the chance to try this wonderful growth factor face serum free of doubts or worries. If Regenesis’s special “age editing” technology sounds like what you’ve been looking for, nothing should stop you from seeing if it meets your expectations for yourself. Don’t Let Another Week Go By Without Looking Your Best! You’re probably eager to get started with Regenesis. I know because I’ve seen this anticipation in the faces of so many of my patients. It’s never too soon to get started on something that promises to erase years from your face. All you have to do to see how Regenesis can transform how you look — safely, naturally and easily — is to click on the link below and order. Because Regenesis gives your skin back what it used to do on its own. It gives your face a youthful look without pain, risk or even much effort. So don’t delay enjoying the pleasure of seeing what Regenesis can do for you. P.S. Age doesn’t wait. Life doesn’t wait. Why wait to see how beautiful you can be? I know, sometimes it’s difficult to make a decision to purchase. That’s why I’ve made this completely risk free. 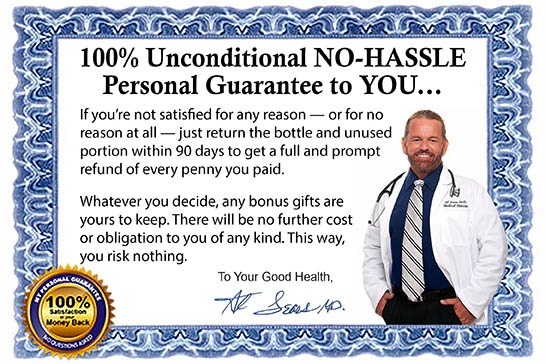 If you’re not 100% satisfied, you can send your bottle(s) back and get a full refund. And you even get to keep the bonus report! The only thing you risk is waiting and not enjoying Regenesis’s remarkable results when you look in the mirror! YES, Dr. Sears! I want to try your new super-serum to promote youthful-looking skin. BEST DEAL! Special VIP Introductory Offer! Get 2 Bottles for One Low Price! That’s a savings of $158 off regular retail price! And if you’re not satisfied you can get a prompt refund of every dollar you paid. That way, you risk nothing. PLUS, you can keep your FREE Bonus Report! Would you rather have the trial offer of one bottle? You’ll get one bottle of Regenesis for $175 plus shipping and handling. That’s 24% off regular retail price of $229! But hurry, quantities are limited. Once this shipment is gone, you will have to wait.